Do you ship internationally? If so, where and what has your experience been? I just shipped an 8" x 10" canvas, framed, via USPS to the UK and it cost me about $37 on my end…and then I found out that the customer (in this case it was my mother, I was just testing it out by sending her birthday present) gets charged an ADDITIONAL 23 pounds by the Royal Mail, before they would deliver! ( not sure how many $'s that is by the current exchange, but, it’s quite a LOT, I’m sure) for ‘customs services’. So that got me wondering, is this typical for international shipping, do most countries charge additional fees? What has your experience been? This kind of thing must be very off putting to potential overseas customers. Hi, I’m living in France and I suppose that it depends of the choosen carryer and of the size of the painting … When I mail a small size painting, I send it well wrapped but I can send it as " letter or small merchandise "and I have no obligation to complete the form for the custom services… The prices is not so high, around $13 . I’m often very disapointed when I see a small painting that I like , to see that the painter doesn’t ship to Europe . I better understand. Thanks for the info, Nicole (Merci beaucoup!) - It sounds like France is a little more lenient about customs requirements. 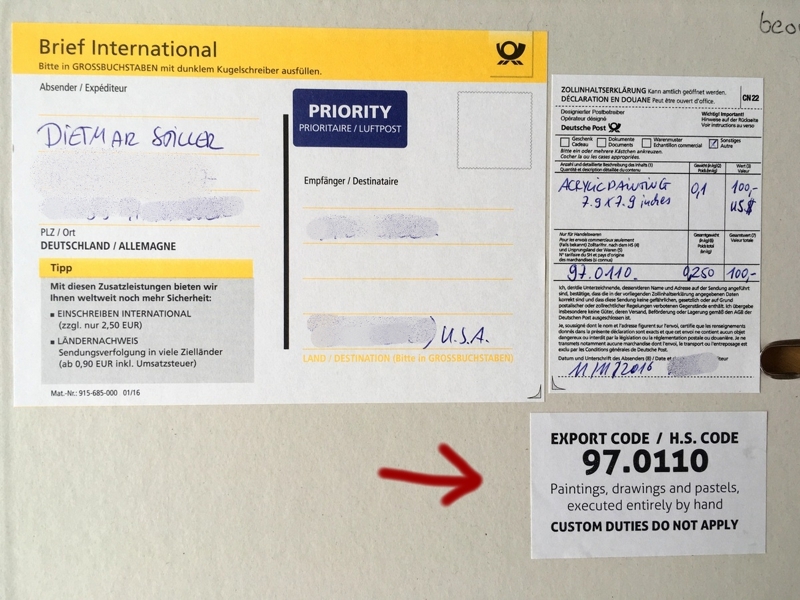 Here in the US we have to fill out a form to send paintings out of the country - but we do not pay duty on something that is arriving here - at least I don’t THINK we do? I have not tried to buy paintings from overseas, I confess. If someone were to ship a painting to you from another country, would YOU have to pay customs fees when it arrived, do you know? hip from Europe to USA and vica versa. Thanks for your input, Imola - It’s very interesting to hear about the various hidden costs for shipping worldwide. I look forward to hearing what UPS has to offer you! I don’t ship internationally anymore. Its just too expensive. Just a few months ago I sold an unopened box of good pastels to a friend in Australia. The box weighed one pound exactly and she had to pay $23.50 shipping on it. That’s more than half the price I charged her for the item. Its just so unfair and I feel its gouging…especially since Chinese sellers often do not pay ANY shipping to send their items here to America! Hello, Nicole–We live in the U.S. now but are planning to retire to Portugal later this year. I hope to continue to sell paintings on DPW and expand shipping to Europe. In your experience, does shipping from one EU member country to another make it any easier? Or, does each country have unique postal & customs rules? I often read in ex-pat Facebook groups how difficult it is to receive packages from the U.S. through Portuguese customs but have never heard about outgoing shipments from Portugal to other EU countries. Guess I’ll find out when we finally get there! Your mother probably had to pay import duty on the value of the item as recorded on the customs form. Unfortunately it makes importing stuff from the USA to the U.K. very expensive. The payment is collected at the point of delivery (unless you use one of those US services which charge all the duty up-front at time of purchase) so it looks like it is Royal Mail making the charge but really they are just tax collecting on behalf of the government. Thanks Karen, yes, I know it is the government collecting their taxes and I now know that it would actually benefit me as a gift giver to just say that the painting is only worth the cost of the paint and canvas (and to not ship the frame - my Mum is 86, I was just trying to make it easy for her to just open and hang it!) But, if I am to be an honest seller, I would have to disclose the cost of a painting on the customs form and then the UK recipient would have to pay the cost, which is high for such a small piece of art and I am sure would be really off-putting to many potential buyers. It just got me thinking about this whole deal of shipping internationally and how there are hidden costs and shipping issues worldwide. Do you have experience in the other direction, shipping from the UK to the US? Yes, I used to sell paintings via DPW from here (UK), all to the US (i am presently on a long holiday from selling!). The US does not charge import duty on art. I think it gets a bit trickier if it is very valuable and/or has a high-value frame and/or is an antique but for DPW purposes, there is no duty charged by the US - so much more civilised than the U.K. I sent paintings via Royal Mail and charged at cost ($18). It could take a while, especially if there was a holiday in the US, where once or twice stuff got stuck at an airport, but it always arrived in the end. To get there quicker I would have to FedEx it and only did that once when the customer paid for it on their own FedEx account (it was a gallery and they bought about 10 at once) because the cost is eye-watering and about the same as the cost of one actual painting! I agree, you have to be honest on the customs form. The only thing you can do for a gift like to your mum is to give her the money for the customs charge by paying it into her bank account. For a commercial sale, you have to be selling at a high enough value for the customer not to mind the customs duties on top, and I would not have been. if it ever gets implemented? You never know! I bought some small paintings from US and they were sent as letters to Denmark. One was sent in a flat rate envelope global priority mail 5 $ and another was at 20 $ and had been opened for customs. What a timely topic - just yesterday a person from UK contacted me through my Etsy store (I live in US), he really wants to buy my 16x20 in painting, but he has exact money only for painting and shipping, but wondering how much would be those custom fees. I don’t even know where to find out about that, sent email to UK custom and they sent automated email that they will answer no later than 2 weeks. Government… what can you do. But whole situation makes me feel uncomfortable - why do I have to find about custom in UK or worry about fees? And already dreading about packing, custom forms… I wish I didn’t list that painting available to ship internationally. If this is correct, it looks like they would pay 2.5% (of the value of the painting plus any insurance you put on it?? I think) Yulia, I found this info after a quick poke around online https://www.gov.uk/goods-sent-from-abroad/tax-and-duty . I will have to check into this and see if it really up to date info and see if that adds up for what my mother was charged, but I suspect this is not correct because it just seems way to low for what she was telling me she paid. Hilda, thank you for the link, I think it helped - I clicked on VAT link, and it said that standard VAT rate is 20%. That 2.5% is custom fees for gifts, it’s hard to say how much custom is for “goods” which are not gift. Well, it seems like my buyer will have to pay at close to $100 extra. That’s not fair. As usual government wins, small folks loose. Inside the EU members it gets a lot easier, and cheaper too! I hope you will love Portugal, it’s my favorite, next to Spain, where I moved a couple of years ago. Good to know, thank you! We are visiting Portugal for 10 days in April to determine which area of the country we want to live in. Probably near Coimbra but not in the city. We will rent at first to see if we like it and I hope to do a LOT of plein air painting there. Did you have a favorite area? Oh, how lovely! I am in love with the coast, so I would have to say Algarve, all the way to the south, I have painted the gorgeous sunsets a few times already, I’d say definitely add it to the list to visit. For me, the northern area is gorgeous but still gets plenty of winter (I used to live in the mountains, with 6 months of winter per year :)). So now, I am enjoying the beach in Valencia, even took a 5 minutes swim today, in February! This year, Deutsche Post (DHL) has quintupled its charges for shipping small goods! Now, a painting may no longer be sent as an “insured letter”, only documents are allowed. This means that sending a small daily painting weighing less than 15 oz from Germany to the USA now costs $50 instead of $10. Other parcel services are just as expensive. Now I will probably have to increase my prices accordingly to be able to send an insured parcel. I also put the label “Unesco Florence Agreement” on a supplementary sheet. 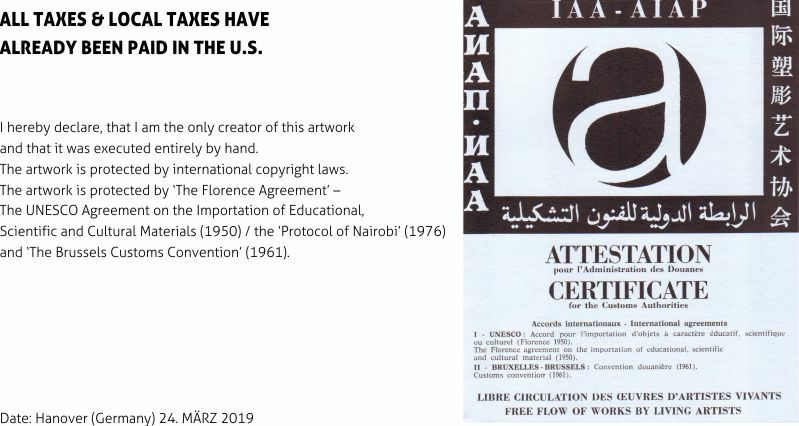 This agreement guarantees you the duty-free exchange of works of art (almost worldwide)! I never heard that my collectors got a problem or had to pay additional custom duties in the U.S. or outside the EU. Thank you for this excellent information, Dietmar! (and Carol!) - I’m really glad I started this thread it has been really helpful and informative.